The derivation of the name Mauchline is purely Celtic, made up of "Magh" signifying a field or meadow and "Linn/Linne" meaning a pool or lake. The Mauchline name can now be found all over the English-speaking world however, its origins are truly Scottish, most likely originally from the area around the present day village of Mauchline, in Ayrshire. Today Mauchline is famous Worldwide for the antique transfer printed wooden objects called Mauchline-ware. There are two main family groups, one based in the West of Scotland and the other in the Borders. The name is primarily spelled ‘Mauchline’, however variants with just about every conceivable spelling exists including: Mauchlan, Mauchlin, Mauchlen, Mauchlain, Mauchlyn, Maughlin, Maughlyn, Mochland and Mochlin. In most families the spelling changes between generations due to illiteracy and probably some heavy accents. Today most of the variants have survived in distinctive groupings. I have not been able to directly link the major family groups with the exception of the occasional later migrant from the borders to the Glasgow area. 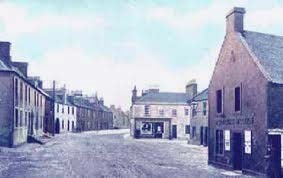 As a working theory the Mauchline name originated as suggested in Ayrshire. However, some time between the 14th and 17th Centuries sections of the family migrated, probably first into neighbouring counties of Renfrewshire and then Lanarkshire where my main family group resides today. Perhaps at a similar time or most likely even earlier some Mauchlines appear to have moved to the border region. This migration was likely to be linked to the continuous border skirmishes between Scotland and England, which really did not end until the Union of the Crowns in 1603. The name variants of Mauchlan and Mauchlen are predominantly found in the Border regions and some of these people appear to have migrated later into Edinburgh, Stirlingshire and perhaps even as far as Aberdeen. I have later found that a variant spelling of Maughlin was fairly common in Northumberland up to the end of the 19th century so there is clearly a possibility that some Mauchlines remained in the English side as a result of local changes in ownership of the land between Scotland and England. Interestingly some of their descendents now spell their name Mauchline. The Maughlin name variant now appears rare in the England/UK although is more common in the US. However, I have found incidences where some of the border Mauchlan/Mauchlen families were occasionally spelled Maughlin, so the name may have died out due to alteration in spelling rather than migration although this cannot be ruled out. My grandmother was Agnes Mackie Mauchline, born in Motherwell, Lanarkshire, on the 24th October 1896. I have traced her family back to John Mauchline born in the late 1790s. I also have records of Mauchlines in the East Kilbride area going back to the 1640s with an occasional record around the same time in Ayrshire but before that, who knows? ?